As The Simpsons draws to a much needed close and after the moderate success of Futurama’s reboot, in many ways I’m glad to see Matt Groening try something different, although in a handful of ways I’m trepidatious. On the one hand we’re applying the beloved comedy that took cartoons in the west to prime time television for decades, to a genre that I have always had a weakness for. On the other hand, that comedy has been getting a little tired after three decades of dominating television. Nevertheless, I sat and watched Disenchantment. At just a handful of episodes, the whole thing took me less than a day, and gave me a respite from the constant – and I mean constant – marathon of Critical Role I’m currently on. And it also took me by surprise, because I genuinely laughed. I shouldn’t be surprised that a Groening creation makes me laugh, and yet I can’t remember the time I had to double back to watch something because I laughed out loud through some dialogue. Satan, a name that strikes fear into all foolish mortals who should choose not to follow his command. What he commands is final, so don’t you dare think you can get away from this week’s list, the final in our series of scary, spooky and downright silly Top 10’s from recent weeks. Now that Halloween is around the corner, what better time is it than now to revel in delight at our Top 10 Depictions of Satan. 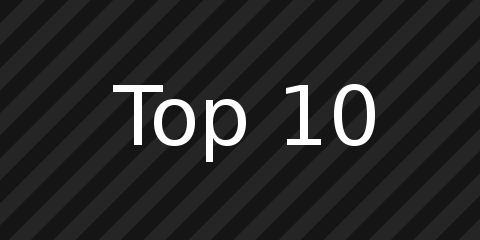 For the love of all that is holy, we’re back for another Saturday Top 10. So for God’s sake, pull up a chair and have a gander through these ancient scrolls that we’ve uncovered, telling us all of the power of these beings. They might not always be physical, but they’re certainly righteous in their own way. So whether or not you’re a believer, this list has been made to try and convert you to our beliefs.